Kanishk Tharoor’s collection of stories reveals a lively mind deeply interested in the world, and a writer with an elegant sense of brevity. “Furiously inventive, beautifully crafted and remarkably assured, Swimmer among the Stars announces the arrival of a blazing new talent,” reads the jacket blurb on Kanishk Tharoor’s debut volume of short fiction. Blurbers who perpetrate such enormities under the veil of anonymity should be hunted down and sacrificed on a slab of basalt under a full moon. They jeopardise literary careers by raising reader expectation to such a pitch that the pages between the jackets can only hold anticlimax. Tharoor’s fiction reveals a lively mind deeply interested in the world, across categories of knowledge. Besides — and this marks him apart — he is keenly aware that every tale worth telling has been told many times before, will be told ever after, and only one of those tellings can be his. There is an old-world humility in this, which contrasts sharply with the turgid prose of the blurb. Recursiveness is the hallmark of Tharoor’s short fiction. The most talked about story in this book — perhaps because it is the very first — concerns the voyage of an elephant from Cochin to Morocco, exiled to please the heart of a princess. Apparently based on a true story, it also recalls the 15th century cargo manifests of the Chinese admiral Zheng He (or Cheng Ho), who brought back giraffes from east Africa for his emperor, who was young enough to value exotic animals over mere valuables. According to one tradition, Zheng’s ships also took a baby rhinoceros from Tamluk in Bengal, but that could be yet another fiction. History, philology and their sister arts form the armature of many of these stories. There is an Alexander cycle, which recalls the era of heroic romances which almost all cultures have witnessed. ‘Tale of the Teahouse’ visualises a Central Asian city waiting for the barbarian horde, and reminds readers that less mature cultures have often been drivers of history in this region, at the expense of decadent civilisations. ‘The Astrolabe’ is set in the early days of colonial exploration, when terra incognita was the realm of the improbably possible. 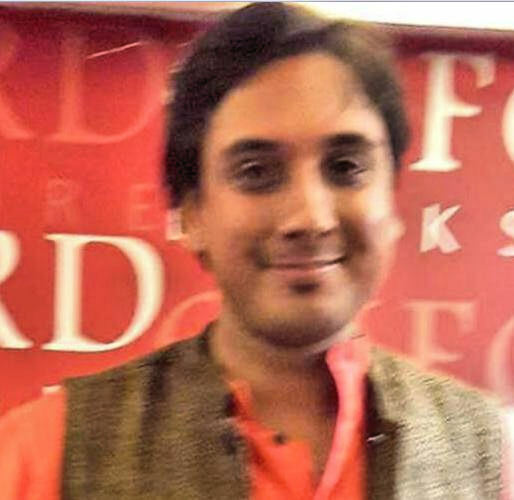 The most successful of Tharoor’s fictions is ‘Letters Home’, a series of fragments which begin and end rather suddenly, and indicate the contours of Tharoor’s wide reading. The influences are diverse, though they all appeal to a certain bent of mind — the mark of Dubliners and Ficciones is clearly visible, but there are echoes of numerous traditions, ranging from Kafka and Gaiman via JG Ballard to Silver Age science fiction. The last is seen to best advantage in ‘A United Nations in Space’, in which diplomats aboard a space station observe the mutually assured destruction of their home countries from orbit. The sci-fi touches are crucial to the plot but appear almost unobtrusively, for instance in the behaviour of sand in low gravity, and the overheads of maintaining artificial gravity in space. Some of Tharoor’s stories are unremarkable, but the only failure is ‘The Fall of an Eyelash’, which is desperately maudlin, and not in an Erich Segal sort of way. And there is a rare slip-up in the Alexander cycle, where Tharoor writes of the smoke from naval guns — clearly an anachronism. 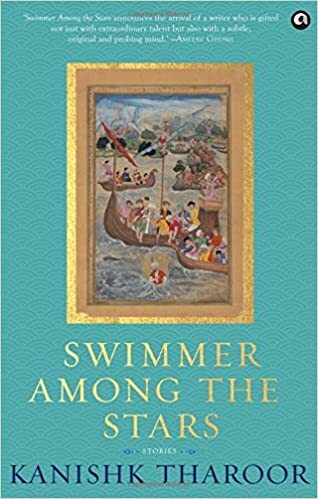 Apart from wide-ranging influences and a gentle but firm grasp over prose which aspires to the condition of poetry, Tharoor’s greatest strength is the elegant brevity of his writing. He knows when to fold his hand and let go of a story, even if it is formally incomplete. He faces a crucial test now. He has ventured into a genre where endings are routinely deferred. He is writing a novel, and publishers can get surprisingly petty if novelists fail to write to the length agreed upon in advance. Hopefully, as he attempts his first novel, Tharoor will be able to retain his sense of an ending. Kanishk Tharoor launches his debut collection of short stories, Swimmer among the Stars in Kolkata (Photo: Payal Mohanka). Kanishk Tharoor puts his global outlook to good use in his debut offering, a collection of short stories on the idea of time and space. 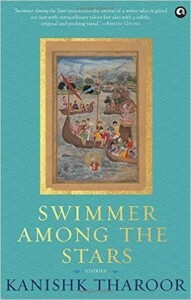 Kanishk Tharoor’s debut short fiction collection Swimmer Among the Stars melts the idea of time and space into a fantastic journey over 12 tales. That’s not all it has to offer, however. As your mind lulls itself into slotting one tale into a particular time period, the next one jumps at you from an entirely new era. The first two stories, Elephant at Sea and The Fall of an Eyelash, for instance, are from the years we can relate to, but the next, A United Nations in Space calls out to you from the future. Its successor Swimmer Among the Stars, however, talks about the last speaker of a language and can be from any time in the human civilisation — the past, the present, or even the future, if more effort is not made to conserve ancient cultures. Why, it was only in 2010 that Boa Sr, the last speaker of an ancient language in the Andaman Islands, died at 85. This story resonated with me, particularly because I can see how my mother tongue is losing its popularity, charm and authenticity in today’s times. Will my vernacular language’s last speaker die, too, in the next few decades? As a result, you will find it difficult to place The Loss of Muzaffar in terms of place and time unless you come through geographical hints such as Hudson and Long Island City. Tharoor’s treatment of the story of the excellent cook Muzaffar, who lives with an Italian family in New York before 9/11, gives it a surreal tinge. The other common theme running through the collection is that the entire human civilisation has suffered at the hands of one another, time and again. Tharoor uses different tools to deliver this message. While The Fall of an Eyelash forces you to understand the poignant tale of refugees, those such as Tale of the Teahouse, The Mirrors of Iskandar and Letters Home show how, for centuries, civilisations have been razed as the land bears witness to bloodshed and life being born again. Ironically, “Geography is never flesh, but stone, water, clay, names and vacant scratches of the plume” (Tale of the Teahouse). At the same time, a story such as Icebreakers gives you an insight into human nature and how some situations warrant generosity and camaraderie — icebreakers, literally. Tharoor, whose criticisms, other short stories and journalistic pieces have already appeared in international and Indian publications, puts his global outlook and experience to good use in his debut offering. With poetic imagery, crisp language and attention to detail, this writer’s neatly tied bunch of stories tie together some mythical tales, some that were inspired by real events, while others that sprung from the imagination of his mind. It’s for you to decide which one is what.